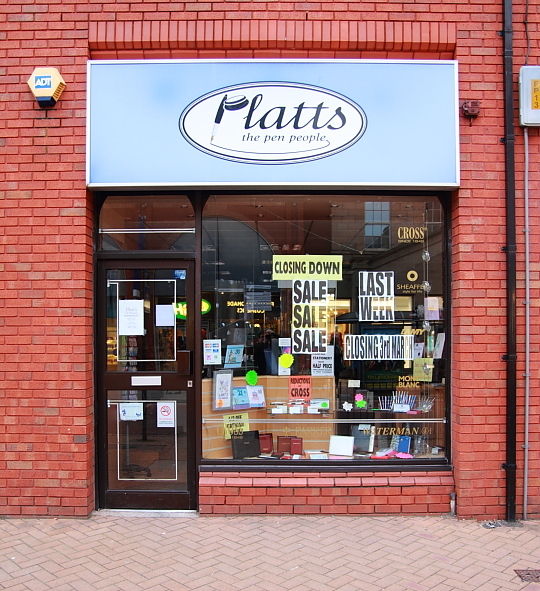 What a shame – my local pen shop, Platts of Preston, will cease trading end of next week. I bought a few nice pens there and my wife’s favourite pen for years, the Lamy Pico, was bought there. I overheard the shopkeeper telling another customer that the new lease for the shop would cost £800 per week – which might be acceptable for some locations, but to me sounds ridiculously expensive for a shop that is in the location this shop is in a city the size of Preston. They will continue to trade at plattspens.co.uk and I wish them the best of luck for their future. That is a shame! The store looks so idyllic and friendly from your picture. Is there another pen/ stationery store nearby? It is sad to say that the pen shops around my area are not approachable. Sales representatives were not knowledgeable, and they just wanted to make a sale. That’s terrible news. Even worse when you read on their site that the shop “has been a fixture in Preston city centre since the 1830s”. I wrote, briefly, about the closing of my local stationers a couple of years ago, and imagine I’d feel the same about Platt’s if I lived in Preston. It is sad when a shop closes down, especially when it’s a Pen Shop (and so old too!). I wish them luck. Have you let them know that you posted about it? It may be heartening for them to read the condolences, if they haven’t already. Like book stores, pen shops have certainly been affected by e-commerce, but has any one else noticed a few book stores popping up every once in a while? I don’t mean to suggest there is a “comeback” happening, but I wonder if a small crack in the Amazon armor (and the folding of Borders) might be helping to keep a few mom-and-pop stores afloat. I have seen a few stores in a few different states, and it’s encouraging (if not too naïve to think so). Rent, it seems, is the scourge of small business and I think since the rise of the Shopping mall dynasties and online retailing, small independent shops on the high street have suffered, with rent increases without turnover increasing (and more likely decreasing) …..certainly this seems to be the case in Australia. You would think rents should come down rather than increase. Sorry to hear the bad news. …and yes, that shop looks so English and homely. Koralatov, it is really sad, but I have to admit that I didn’t go there so often myself, only once every few months. The problem is that parking in the city centre is just so expensive… Did you find another nice shop or is it Paperchase for you now? Palimpsest, I hope their online shop will be successful, but it looks pretty standard to me – a shop were you buy if you know what you want, not like an online shop where you can discover new things, like Jet Pens or Cult Pens.. I hope that will improve once they switch to online only. Sean, they don’t know I have a blog. I tried to start a conversation about the situation in the UK regarding online shops, but the shop was about to close down and the shop keeper had to leave to catch a bus. They might find the nice comments left here sooner or later if they search for their shop on the Internet or if they check who links to their online shop. I didn’t notice new book stores opening in the UK, at least not in Preston, but I did notice this in/near my home town in Germany. Would be nice if these shops have enough business to survive..
Matthias, you are right on the major malls, nearly all chains and boutiques. This has nothing to do with the content of this post, but hey, what the heck.. I’ve always had a soft spot for Preston, because when I was a boy in South Yorkshire in the 60’s, our coach always travelled over the pennines and through Preston (Ribble buses everywhere) on the way to Blackpool for our summer holidays. OK, OK…enough. For shame! But a sign of the further polarisation of the stationery market in the UK. Whilst Smythson’s of Bond Street increase profits, and John Lewis report a more than doubling of sales, the supermarket chains have captured the cheap end. But where does that leave the traditional small town stationers? They face a pincer movement of rising overheads and moronic local authorities who overcharge for town centre parking (it’s the same where I live, too) whilst selling products which are seen increasingly as commoditised, and cheaper down at Tesco. I wish Platt’s well in their new online incarnation. If they can show a bit of individuality they could thrive. I hope they can.